All-In Productions create theatre and interactive experiences for those who don’t normally engage in the arts. 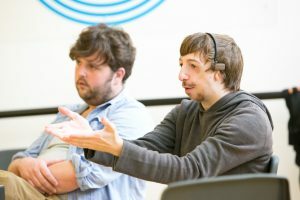 We aim to move and amaze audiences with the theatre that we produce whilst making the experience accessible as possible, removing the barriers that audiences may have faced in the past. For example our Sign Cafe’s that are held the second Friday of every month at the Garage Cafe. Click here to find out more.